Workshop 4: Trend Trading. Price Series. Backtests. Prediction is difficult. Especially about the future. ► All strategies presented here are meant for educational purposes. They all are designed for simplicity, not for maximum profit or robustness. For really trading such a strategy, you would normally add more entry filter rules, and you would also use a more complex trade exit method than a simple stop. But we'll keep it easy in the workshops. ► The backtest results included here can be different to the results you'll get when testing the scripts yourself. That's because you're most likely using a more recent simulation time period, and different spread, commission, and rollover parameters which are updated when connecting to a broker. If not otherwise mentioned, the included scripts are set to a simulation period from 2010-2017; for a different time period modify the StartDate and EndDate lines in the script. (If you're not yet familiar with scripts, start with Workshop 1.) We can see that the function is now named "run" and not "main". While a main function runs only once, a run function is called after every bar with the period selected with the scrollbars. By default, the bar period is 60 minutes. So this function runs once per hour when Zorro is trading. The vars definition creates not a single var here, but a var series - a var 'with a history'. Thus, vars Price = series(price(0)); means: define a series with the name "Price" and fill it with the return value of the price(0) function. We also define a series named "Trend" with the return value from the LowPass function, a second order lowpass filter. The lowpass filter attenuates all the wiggles and jaggies of the Price series that are shorter than 4 weeks, but it does not affect the trend or long term cycles. You can see the frequency characteristic of the LowPass filter in the image on the Filter page. A lowpass filter has a similar smoothing effect as a Moving Average function (see Indicators), but produces a better reproduction of the price curve and has less lag. This means the return value of a lowpass filter function isn't as delayed as the return values of Simple Moving Average or EMA functions that are normally used for trend trading. The script can react faster on price changes, and thus generate better profit. The next line places a stop loss, with a limit of 4*ATR(100). The ATR function is a standard indicator. It returns the average height of a candle within the last 100 bars. So the position is sold when the loss exceeds the average size of four candles. By setting Stop not at a fixed value, but at a value dependent on the price fluctuation, we adapt the stop loss to the market situation. Any strategy should have a mechanism for detecting if the exploited price anomaly is present or not. In this case, if the market is trending or not. we are using the Market Meanness Index, an indiator that performs a statistical analysis of the data. The code calculates the MMI for the last 300 bars and smoothes it, again with the LowPass filter. Trades are entered when the smoothed MMI is falling, indicating the begin of a trend. The valley function returns true when the series just had a downwards peak. The peak function returns true when the series just had an upwards peak. The if(..) condition is then fullfilled, and a long or short trade with the selected asset is entered. If a trade was already open in the opposite direction, it is automatically closed. The red line in the chart above is the Trend series, the lowpass filtered price. You can see that it has a peak at the end of September, so the peak(Trend) function returned true and enterShort was called. The tiny green dot is the moment where the short trade was entered. The Trend series continues down all the way until November 23, when a valley was reached. A long trade (not shown in this chart) was then entered and the short trade was automatically closed. The green line connects the entry and exit points of the trade. It was open almost 2 months, and made a profit of ~ 13 cents per unit, or 1300 pips. You'll most likely get a different result when testing this strategy in a different time period or when your simulated account has different spread, rollover costs, commission, or slippage. By default, the simulation runs over the last 6 years, f.i. from 2012 until 2017. The strategy achieves an annual profit of ~400 pips, equivalent to about 30% annual return on capital - that's the average profit per year divided by the sum of maximum drawdown and used margin. The average monthly income (MI in the window) is 3 $. That's quite modest, but Zorro simulated a microlot account and needed only ~100 $ capital for running the strategy. So you have about 3% return on capital per month. By the way, the '$' sign in Zorro's messages does not necessarily mean US-Dollars, it represents the account currency. In the image that pops up in the chart viewer, you can see a black curve and some green lines and red dots attached to the curve. In the background there's a jaggy blue area and a red area below. The black curve is the price of the selected asset - the EUR/USD. The price scale is on the left side of the chart. The green and red dots are winning and losing trades. The green lines connect the entry and exit point of a winning trade. You can see that there are far more red than green dots - about 80% of the trades are lost. However, the long-term trades all have green lines. So we have a lot of small losses, but several large wins. This is typical of a trend following strategy. The most interesting part of the chart is the blue area that represents the equity curve. We can see that it's slightly below zero in the first years, then rises to about 300 $ in 2016. The red area below is it's evil counterpart, the "underwater equity" or drawdown curve that indicates losses on our account. The more blue and the less red, the better is the strategy. This one gives a mixed result. There are a few winning years, in the other years we had a loss or a tie. This shaky behavior is reflected in the low Sharpe Ratio and the high Ulcer Index (UI) of the strategy. The meaning of the cryptic messages is explained in the trading chapter. Checking the log is the first (or maybe, second) thing to do when testing a strategy, for determining if it trades correctly. You can see in the log that most trades are lost. Zorro seems to deliberately enter trades in the wrong direction; trading at random would only lose a little more than 50%, not 80%. But there's a method behind this madness. The algorithm wants to be in a favorable position when a long-term trend begins, and then keeps the position for a long time. That's why it wins in the long run despite losing most trades. For generating the chart, all trades are sorted into buckets, depending on their profit. Every bucket is represented by a red and a blue bar. Trades with a loss between -200..-100 pips go into the first bucket at the left side, marked -200 at the x axis. The next buckets are for trades with loss or profit from -200..-150 pips, -150..-100 pips, -100..-50 pips, and so on. The height of the blue bar is the number of trades ending up in that bucket (right y axis), the height of the red bar is the sum of all profits in the bucket (left y axis). We can see that most trades end with a loss between 0 and -50 pips. 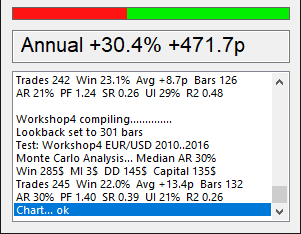 The total profit of the system comes from relatively few profitable trades, some even with about 1000 pips profit. Aside from a lowpass filter, several other filter algorithms are often used for detecting trend changes. You can find a comparison of trend filters in the Trend Indicators article series on Financial Hacker. A more detailed description of developing trend trading systems and evaluating backtest performance can be found in the Black Book. A strategy script contains a run function that is called once per bar. A series is a variable with a history. It is recommended to use a naming convention (f.i. variables begin with uppercase, functions with lowercase, series end with 's'). A lowpass filter removes the jaggies from a price curve without much lag penalty. It is superior to traditional moving averages. A stop loss limits the trade risk. Filtering trades improves the strategy performance. The valley and peak functions can be used to buy or sell at the turning points of a curve. Use the LOGFILE switch for checking the strategy behavior in detail. The #include statement includes another script. 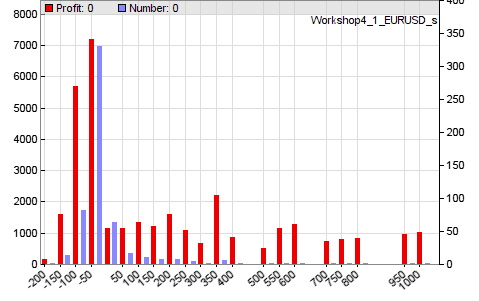 The plotTradeProfile function gives insight into the trade profit distribution.